Tile Stencils are super popular in today's DIY decorating! Our Tangier Tile stencil pattern is a perfect money saving alternative to the popular but pricey cement tiles, or wallpaper. 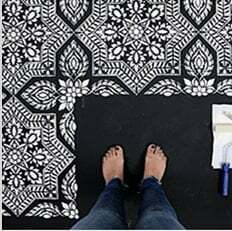 You can stencil this beautiful pattern on the wall, or on your floor. You can stencil right over your old dated tile floor or an ugly linoleum! With our Tile stencils, it is easy to create a dramatic tile wall or floor.